As the fall leaves start to accumulate here in the temperate parts of North America, most gardeners are thinking about wrapping up things for the year. In this article I’ll show you how to extend your garden into winter to have fresh, healthy produce throughout the year. However, there are number of ways to extend the season and keep your garden productive with hardy leafy greens and root crops throughout the chilly winter weather. I’ll cover some key techniques for preserving your crops through frost and low temperatures, and list some crop choices that actually do better in cool weather. In the late 19th century and early 20th century, Parisian market gardeners were able to continue to grow throughout the winter to keep tables in France stocked with fresh produce. Without petroleum-based technology to fuel their growth, they relied on green manures and waste products from the many horses that existed at that time to keep their crops warm during the winter and continually fertilize their small plots for maximum efficiency (the gardens may be gone now, but you can still see the markets here). Many of these techniques and tips for growing crops in winter conditions have been lost, but fortunately Elliott Coleman, a market gardener in Harborside, Maine, revived these techniques in the 1990s; he has been an advocate for four season growing since then and has inspired and motivated other growers to extend their growing seasons. What Elliott noticed after careful observation and experimentation was that many winter vegetables were actually more sensitive to temperature changes than to the seasonal reduction in the sun’s irradiance (a measure of the sun’s radiation, measured in watts per square meter). 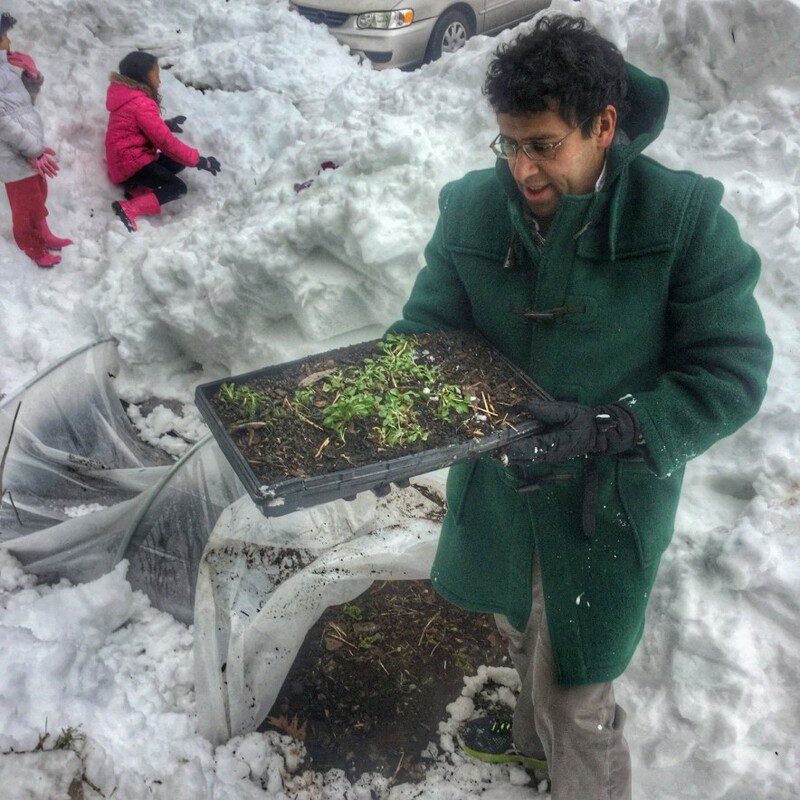 By focusing on low-cost methods to raise the soil and air temperature, he was able to get 2 extra seasons of growing (fall and winter). After experimenting with various solutions, he invented a 2 layer low tunnel hoophouse solution which is both economical and easy to set up for your raised beds. Purchase 1/2″ aluminium electric conduit (usually comes in 10ft lengths). Overall, this method can keep the temperature inside the low tunnel about 6 degrees warmer than the outside weather, which in many cases is just enough to keep hardy vegetables from receiving frost damage. Below I’ve listed a few other techniques for protecting your winter crops suited for suburban/urban gardens. This consists of a box with a clear sloped lid, usually made out of glass or plastic. The box can be buried in the ground and collects the sun’s heat during the day. 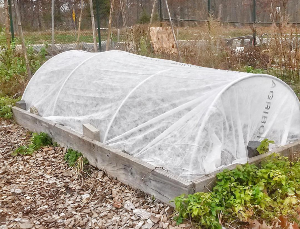 A well-made cold frame can shift your growing zone for that box up by one zone (for example, if you are zone 6, the cold frame could allow you to grow like it is zone 7). You may need to vent the air in the box on warm days during the winter. An old technique that involves placing a clear glass or plastic bowl with a wide lip over each plant. 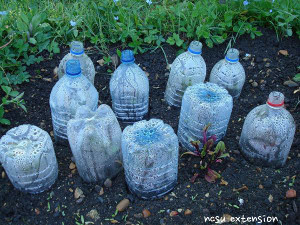 It works well with seedlings and young plants to help them get established. A variation on this involves the container having walls that can be filled with water. The water absorbs heat during the day and even when frozen protects the plants inside (think of an igloo). These techniques help to insulate your crops from the cold weather, but they won’t change the environment enough that you can grow summer fruiting crops like tomatoes and melons. Your choice of winter hardy vegetables is key to insuring that they can handle whatever weather is thrown at them. As far as annual vegetables go, leafy greens and root crops seem to do better at handling frost temperatures (below 32 degrees fahrenheit). I’ve listed a good selection of these crops below. the lettuce family is quite broad, and there are many heirloom varieties (Artic King, Ice Queen, etc.) that are hardy down to freezing (and even then can survive the winter if their roots are established). 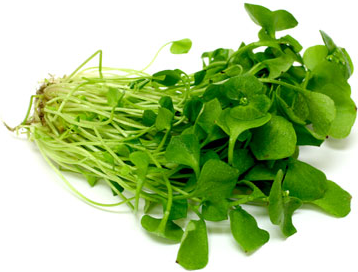 A nice hardy green that can be added to salads, mache grows fast and tastes great for a change of pace. A short, spreading green first found by miners looking for food during the 1849 California gold rush. 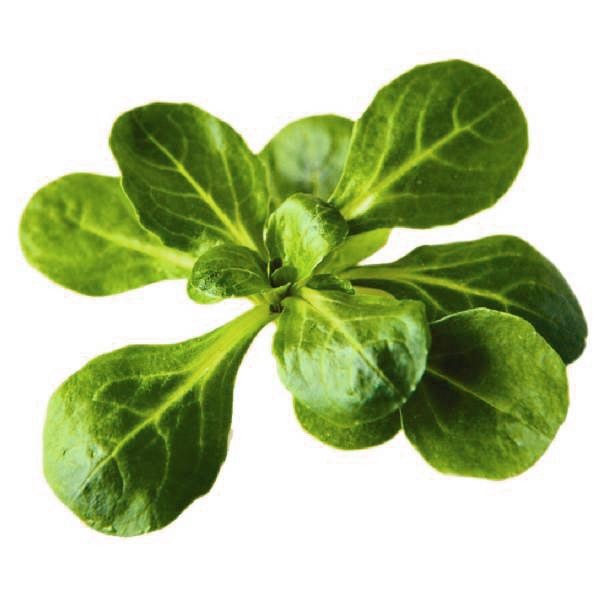 It has a nice crunch similar to bean sprouts and is high in vitamin C.
There are a number of brassicas other than Kale that do well in cold weater (most brassicas prefer cooler weather to thrive). 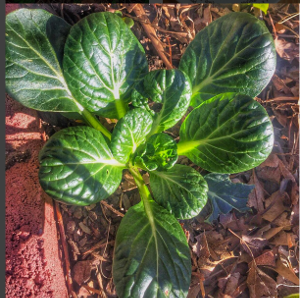 Collards are like big, loose cabbages, Brussel Sprouts’ leaves can be harvested separately of their more well-know side shoots, and Tatsoi is very tasty in stir-fries (although I’ve found it not quite so hardy as the others). Spinach is another hardy green vegetable, but it’s important to start this one earlier in the summer/fall to establish as I’ve noted it doesn’t grow much if the seedlings are transferred too late into the fall. I’ve left out typical winter cover crops like Alfafa, Clover and Winter peas since these are used more for building the soil. I’ve also left out growing Winter grains like Barley and Oats since it isn’t practical to grow them in a suburban or urban garden. Where regular peas start to die off around freezing temperatures, Fava beans are a bit more hardy and withstand temperatures down to 20 degrees. They also establish a deeper root system and more foliage than peas, so they can produce more green fertilizer. 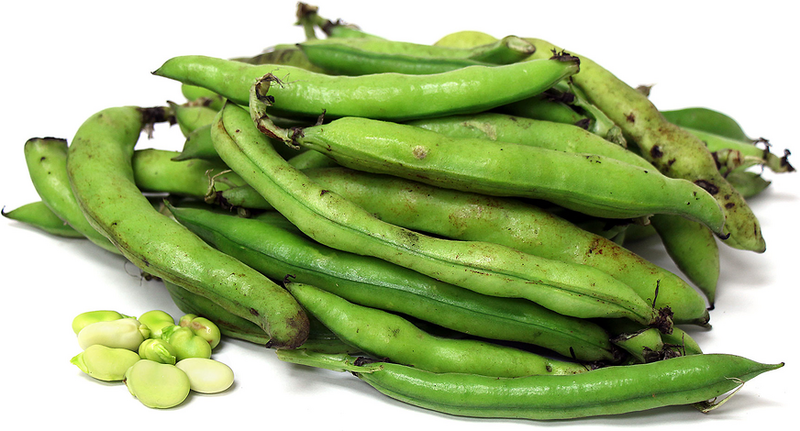 The only pain with Fava beans is that they require double shelling, which is time-consuming and as a fruiting crop, there are not going to be too many pollinators out and about until March at the earliest. Carrots are a hardy biennial that actually grows sweeter as the winter weather sets in as they convert some of their starch into sugars to survive the cold temperatures. If you time your plantings correctly, you can pull up carrots the whole winter. A relative of the carrot, parsnips require fresh seed to be viable, but they grow steadily during the winter months and rapidly increase in size during the early spring months. Like carrots, they taste sweeter in the winter months. Beets will slow down their growth during the winter months but their leaves can be harvested and used during the winter in the same way as spinach and swiss chard. Because Beets grow greens so quickly, they can be continuously harvested of their leaves during the winter and picked for their roots in the spring. Many onions are also biennial, so they can be planted in the fall and harvested in the spring/summer of the following year. Of particular interest for winter growing are leeks and garlic, which can handle most of the cold weather thrown at them without any problem.